Shop for that beautiful handmade card. Most are left blank for your own greeting. 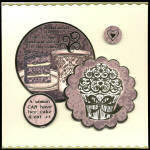 These individual cards are all handmade using a variety of mediums, so no two are alike. Some are made with wire and semi precious beads, others by using photographic images. New designs are added throughout the year, depending on available materials or artistic inspiration! There are currently 25 cards on this page. Cream square card with cake and chocolate design. 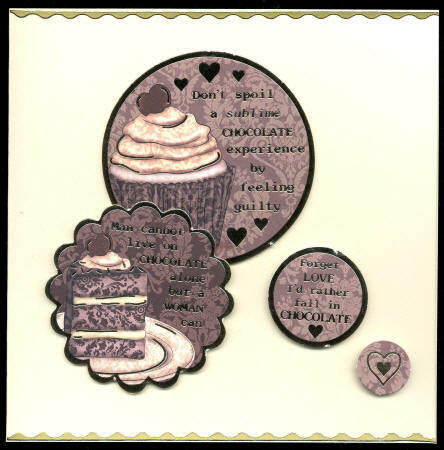 "Don't spoil a sublime Chocolate experience by feeling guilty"
"A balanced diet is...cake in one hand and a cuppa in the other"
"A balanced diet is...cake in one hand and coffee in the other"
on a cream card with jade handmade paper. Colour co-ordinated text reads : Birthday Wishes coming your way. with silver beads on a cream card, mulberry paper and silver floss. Being handmade, each card will vary slightly. Cream card with a brass wire Fairy shape, who has dangly arms and legs. With pearl and turquoise coloured beads on gold flecked navy card and mulberry paper backing. on copper colour mulberry paper and gold flecked card backing. With turquoise coloured and pink seed beads on gold flecked navy card and mulberry paper backing. Aperture card with Fennel photograph printed onto transparent film. Very pretty with the light shining through. Aperture card with Green Chrysanthemum photograph printed onto transparent film. with pink 'gel' gifts against a pretty background. This card is blank so is suitable for many occasions. Silver, pink and lilac Champagne bottle and glasses. 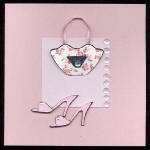 Flower beads handle and silver wire bag shape on white deckle edge card with mulberry paper backing. 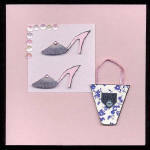 with handbag, matching shoes and sequins.